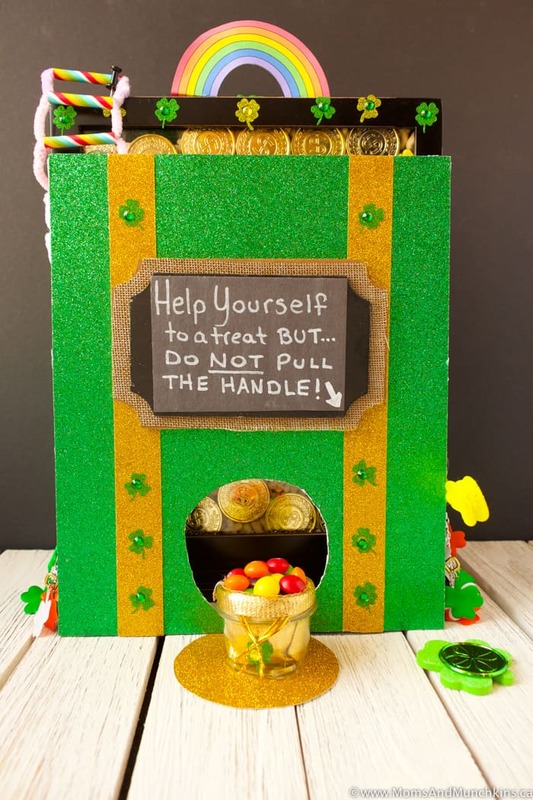 Thinking of building a leprechaun trap this St. Patrick’s Day? 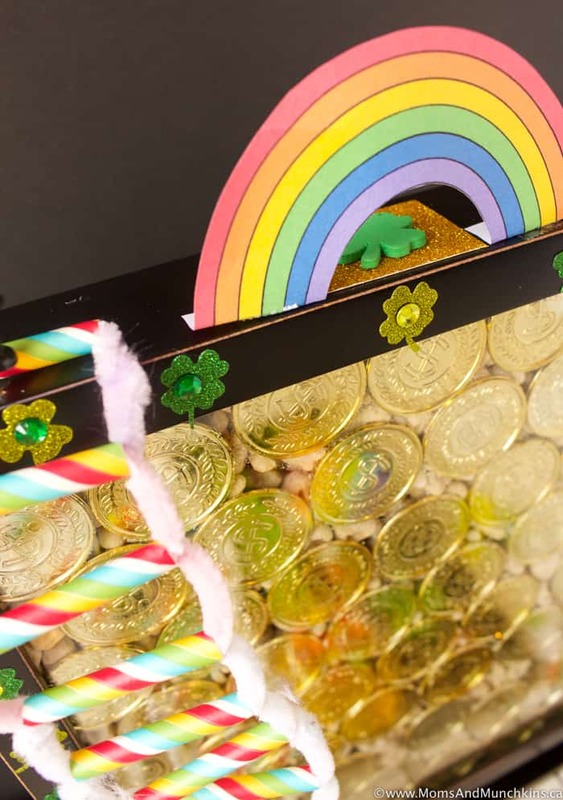 This collection of leprechaun traps may just help you catch a leprechaun. Are you asking yourself why you’d want to catch a leprechaun? Well, the number one reason is so that he can lead you to his pot of gold. Leprechauns are known to be extremely clever though so it’s best to have a plan in place before St. Patrick’s Day. First of all, you need to know how you are going to catch him and that’s where these ideas come in handy. Before we jump into the creative ideas, let me assure you no leprechauns were harmed during the making of this post. If there’s one thing a leprechaun can’t resist, it’s gold. 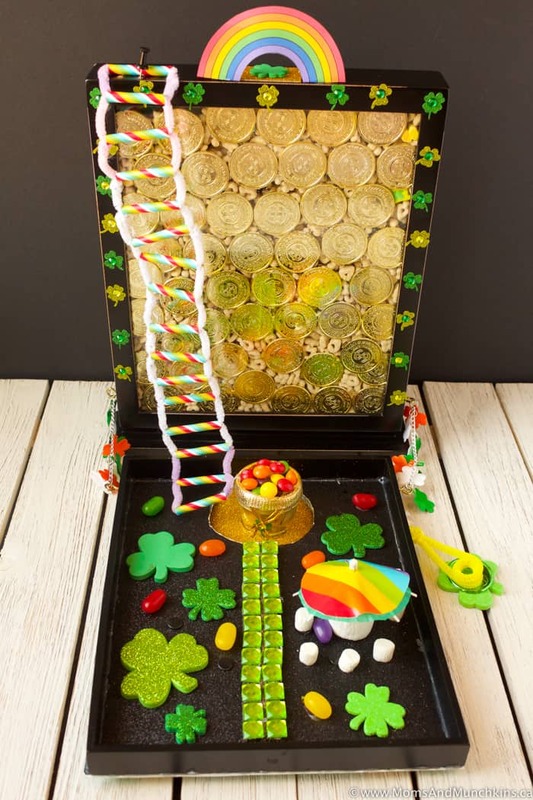 This leprechaun trap is made using a shadow box, lots of rainbow candies, and gold bait. This trap tricks the leprechaun into climbing a ladder and then falling into the shadow box. Ladder – paper straws and pipe cleaners. Mix and match themed decorations like stickers, rainbow candy, plastic coins, rainbows, paper umbrellas, chalkboard sign, etc. The Shadow box comes with a plastic insert approximately 8.5″ x 11” x 7/8” thick. Cut 2 sheets of cardstalk (one for the inside, one for the outside, or use a two-sided cardstock) and glue cardstock on the outside front of base so the inside is like a diorama (a shallow box you’ll fill with goodies for the leprechaun). We used green glitter paper on the front and black glitter paper on the inside. Note: glitter paper can be hard to work with because it doesn’t stick properly with glue or tape. I’d suggest using a matte paper and decorating it with glitter stickers after. 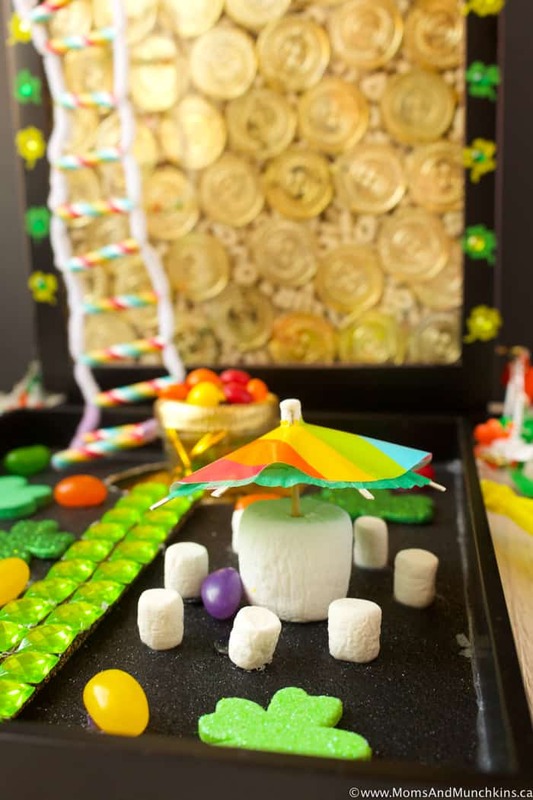 The diorama can include items like a pot of gold, rainbow candies, rhinestone pathway, mini umbrella with marshmallow seating area, etc. You’ll want to choose diorama pieces that you can easily glue down onto the paper. The pot of gold doesn’t have to be glued down inside the diorama though because you’ll have the hole cut out for this. The pot of gold was attached to the base of the shadow box using a strip of double sided tape and cutting out round gold base for it to sit on. 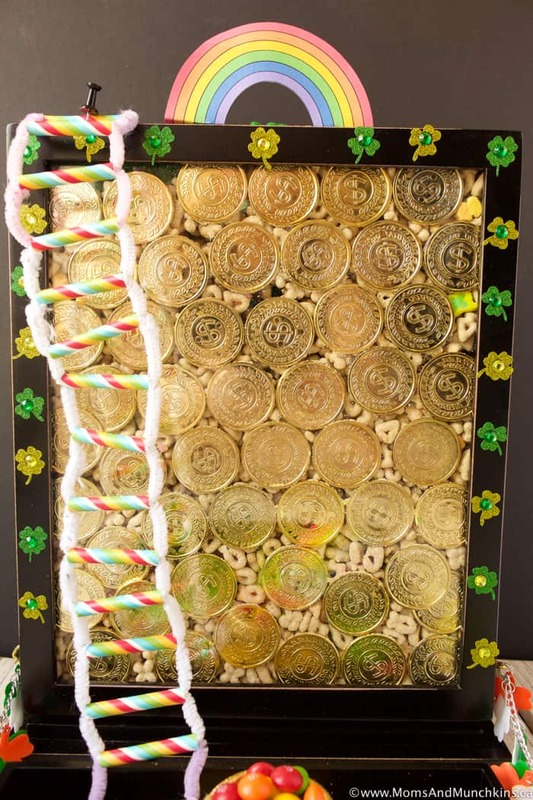 Fill the inside of shadow box with coins and Lucky Charms cereal. 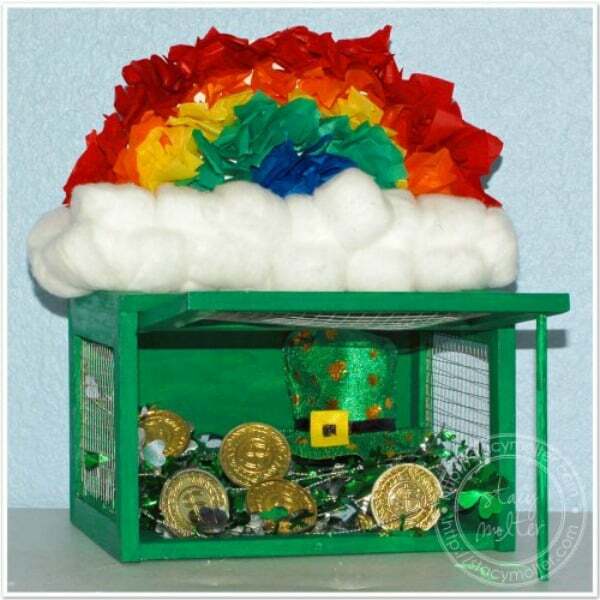 You’ll want some sort of hole cut in the top of the shadow box (or slightly leave the back panel open so the Leprechaun slips and falls inside) and cover it with tissue paper so the leprechaun falls into the box to be captured. He’ll have plenty of Lucky Charms to snack on while he waits for you to let him out in the morning. So how does this work? Well, you’ll make a sign on the front of the insert (bottom side of the diorama) that says something like “Help yourself to a treat but DO NOT PULL THE HANDLE!” As you know leprechauns are rule breakers so he’ll likely pull the yellow handle on the side which will knock the diorama down and show him all the glitter, gold and candy inside. He’ll then notice the gold coins and Lucky Charms inside the shadow box, climb the ladder to get to the top, then fall into the shadow box. Don’t worry, the Lucky Charms marshmallows will soften his fall and he’ll have plenty of snacks to enjoy while waiting for you to find him. 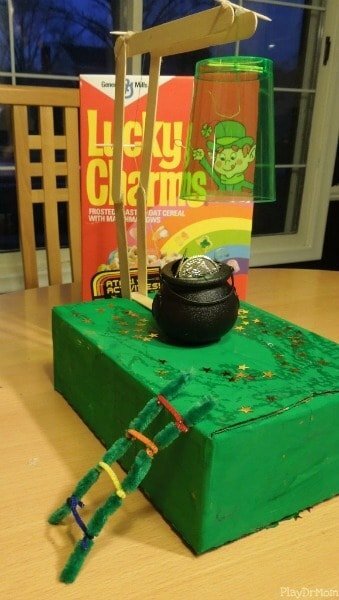 There are so many creative ideas out there for building a leprechaun trap! Here are some other clever ideas from other bloggers, parents and kids. If you’d like to see more information on any of these traps, simply click on the title of the trap and it will open up in a new window for you. We’ve also tried making our own Golden Resort leprechaun trap but we weren’t successful. We’ll keep trying and I’ll let you know of any developments! 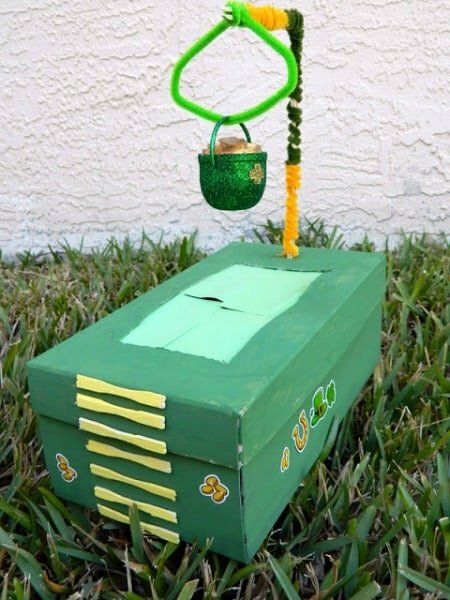 This leprechaun trap by Play Dr. Mom has two things leprechaun’s love – gold and Lucky Charms! 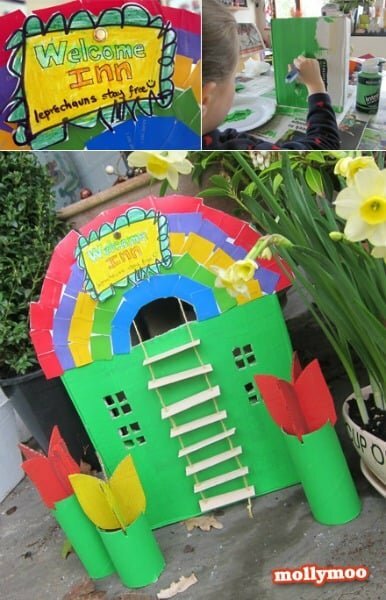 MollyMoo heard a rumor that leprechauns can’t turn down a bargain so they created this leprechaun trap motel with a “Leprechauns Stay Free” sign. Very clever! They key to building a successful leprechaun trap is understanding that one size doesn’t fit all. What works for one leprechaun may not work with another. Modern Parents Messy Kids has a solution – a DIY chalkboard leprechaun trap that can easily be redesigned for the perfect trap! 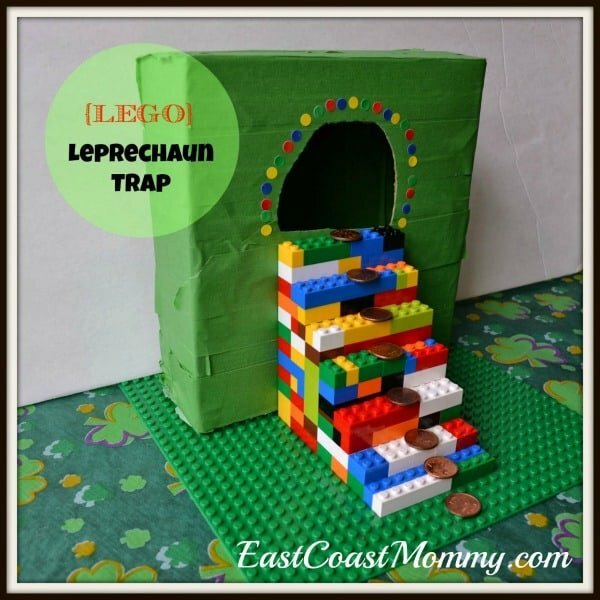 Over on East Coast Mommy you’ll see that many items you already have around the house could be used for a leprechaun trap. 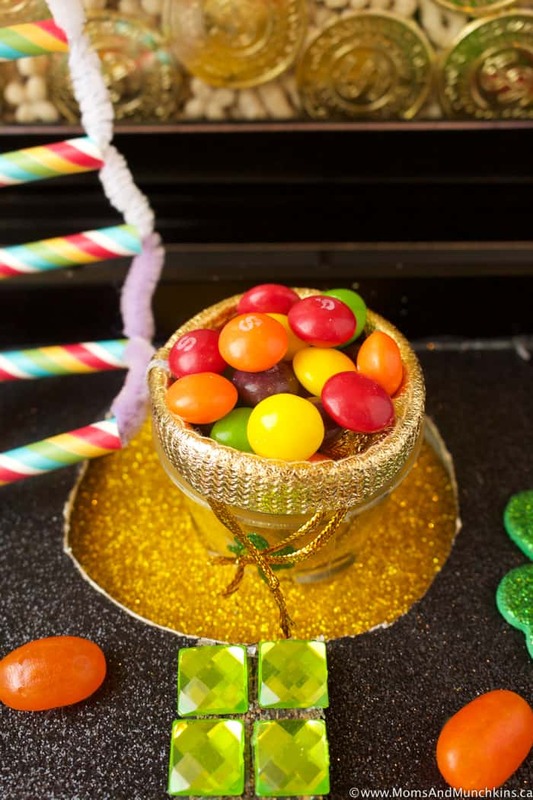 Be sure to grab the recipe for leprechaun bait while you’re checking out their design! 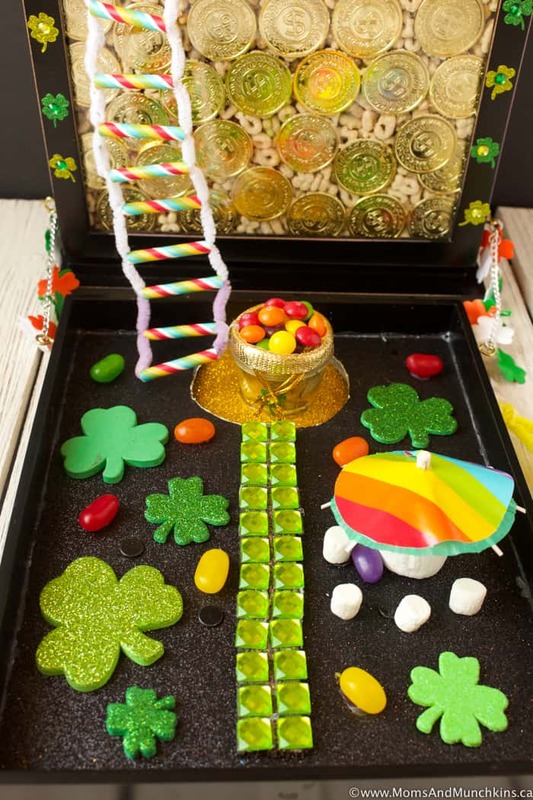 Marshmallow Mudpie has really thought of everything with this leprechaun trap – even a soft landing so the leprechaun doesn’t get hurt. 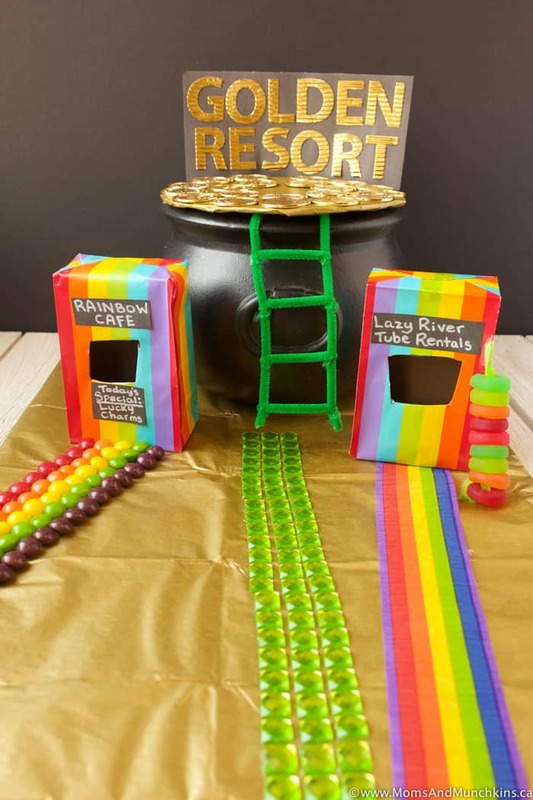 Don’t miss out on the free printable St. Patrick’s Day games while you’re checking out their leprechaun trap design. Do you know where to find a pot of gold? At the end of a rainbow! Fancy Shanty kept this in mind while designing their leprechaun trap. If there is one thing a leprechaun can’t resist, it’s a rainbow! Love Bug Living used this to their advantage while planning their leprechaun trap. So you’ve captured a leprechaun…now what? 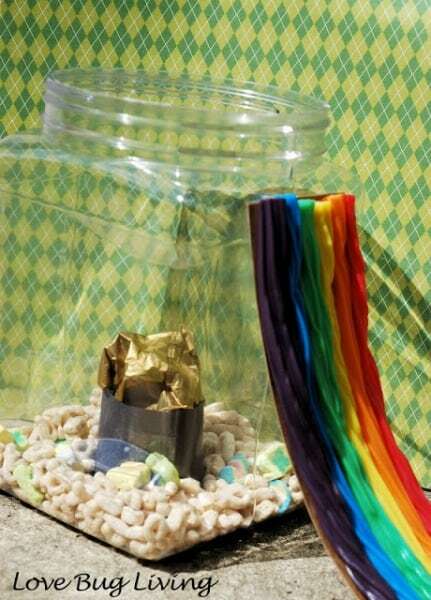 It’s best to discuss your family action plan to decide how you’ll convince him to lead you to his pot of gold. You can never be too prepared! Visit our St. Patrick’s Day page for more creative ways to enjoy the holiday with your family. We’re always adding new ideas for family fun. Never miss an update by following us on Facebook, Twitter, Pinterest, and Instagram. I absolutely LOVE this round-up. What a great collection of Leprechaun traps! Thank you SO much for including our trap too! What a fun list! Thanks so much for including our trap!